I have started an experiment with my cousin since 1997. In a banquet 10 years ago, many of my relatives and I celebrated the golden wedding of my grandpa and grandma. At that time, they were still alive. 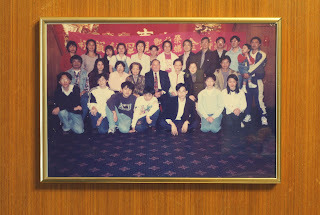 Sitting next to a cousin named Ming in our relative banquet is my custom but we seldom get together in our daily life. That is hard to explain why we get so close without much time getting along. To share a thought with him that night, I said, “Time go by so fast. Can we try to blink our eyes in this moment and endeavor to remember this blink? Then ten years later, we blink our eyes again; see whether we have the feeling of time going so fast within a blink or not.” In a relative banquet in 2007, I sat next to the cousin and we blinked our eyes again. The feeling of us was incredibly coherent, same like remaining unchanged. I heard a story about a Chinese painter. The feeling of drawing the first and the last line to him is same and fresh. We are always we used to be.